Political groups, charities and other groups are all opposed to the IMF’s proposal for a means-tested system. 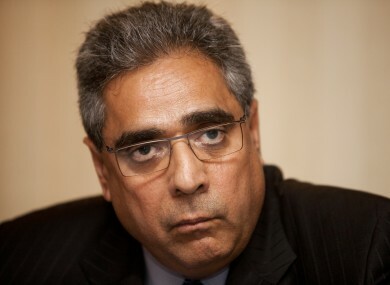 Ajai Chopra and the IMF have come in for attack after suggesting Child Benefit should be means-tested. OPPOSITION POLITICAL PARTIES and other lobby groups have come out against the IMF’s suggestion that the Child Benefit system should be reformed to allow means-testing. In an annual report yesterday, the IMF recommended “better targeting” of Ireland’s spending on child benefit, as well as the assignment of medical cards – saying such reforms could “generate significant savings while protecting the poor”. The proposal has met with significant ire from support groups and politicians alike, however, with a number of groups issuing statements opposing the plans today. Barnardos chief executive Fergus Finlay said his charity favoured the universal payment system currently in place, because means testing was “not, in our opinion, a viable option”. “There are already a number of means tested income supports for parents but there continue to be challenges regarding the poverty traps that these can create,” Finlay argued. He added that a system of means-testing would be “bureaucratic and administratively difficult and expensive”, and could leave some families worse off – putting their employment and financial stability at risk. The Children’s Rights Alliance also asked the government to ignore the IMF suggestion, with chief executive Tanya Ward saying the current system had flaws that would not be remedied by a reform in how the benefit is awarded. “We need to remember that in Ireland we do not give families tax credits, despite the additional costs associated with raising a family,” Ward said. Stopping the wealthy from getting Child Benefit is approaching the issue from the wrong angle – if you want to raise money from the wealthy, use the existing taxation system. A spokesperson for the Family Resource Centre National Forum said a means test would be a “blunt instrument”, and could indeed act as a potential barrier to employment for some parents. The FRCNF instead suggested that child benefit could be subject to taxation – a move which it said would retain “the universality of the payment” while also making sure that lower-income families were able to retain the payment. Fianna Fáil’s social protection spokesman Willie O’Dea said he would “vigorously” oppose any plans, believing that the IMF’s logic was based on the logic that only those on low incomes “needed” the payment. “Many average income families that are tied into crippling mortgage repayments need all the help they can get,” O’Dea opined. His Sinn Féin counterpart Aengus Ó Snodaigh said the IMF was “plain wrong”, saying the Fund was merely “lining up the ducks” and “telling the government what they want to hear”. When I met the Troika earlier this month they made it clear that the reason they are suggesting social welfare cuts at all is because the government have chosen to pursue deficit reduction with spending cuts rather than by raising revenue from the wealthy. Tánaiste Eamon Gilmore told the Dáil earlier this morning that the IMF’s recommendations were not binding on the government, and that the government would not necessarily adopt any of the suggestions. Poll: Should child benefit be means-tested? Email “Opposition, lobby groups come out against means-tested Child Benefit”. Feedback on “Opposition, lobby groups come out against means-tested Child Benefit”.